"The Disorder EP is real tense record with especially great sharp guitar noodling, a singer with a cool vocal style and a touch of artiness, especially on "Glass Eye Threat". Nice paranoid lyrics add to the tension. As does the picture sleeve artwork for that matter." 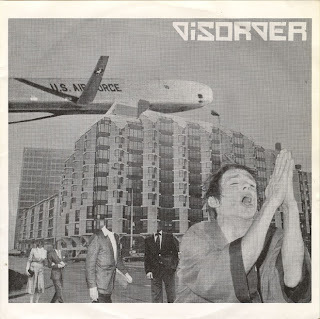 I accidentally run into this record on my never-ending search for DISORDER (UK) bootlegs. Although this band from Netherlands has nothing to do with DISORDER we all love,this is really a masterpiece. Really weird music,kinda mix of early punk with Joy Division feeling. Really rare to find both on mp3s and vinyl. Lyrics and cover included.